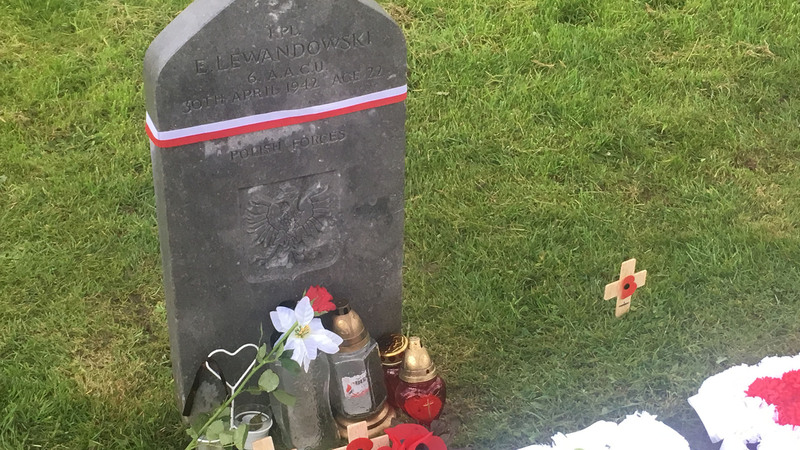 Polish Airman Sergeant Edward Lewandowski piloted Westland Lysander P1731 on 30th April 1942. The plane came down after take-off from RAF Sydenham, Belfast. Westland Lysander P1731 took off from RAF Sydenham, Belfast, Co. Down on 30th April 1942, piloted by Sergeant Edward Lewandowski. The plane came down near the airfield after an accident shortly after take-off. Shortly after take-off, the 22-year-old Polish Pilot flying with No. 6 Anti Aircraft Co-operation Unit struck a barrage balloon cable. Grave of Flight Sergeant Edward Lewandowsi (P-783109). He served in the Polish Air Force and is buried in Milltown Cemetery, Belfast, Co. Antrim. Photo taken on 11th November 2017. Copyright Scott Edgar - World War Two Northern Ireland. The RAF Sydenham airfield on the shore of Belfast Lough had barrage balloon cover to protect from Luftwaffe attacks. Flying too close to one of the cables, the wing of Westland Lysander P1731 came into contact with the balloon tether. The plane spun out of control coming down near the airfield. Sergeant Edward Lewandowski died in the resulting crash. His grave is in Milltown Cemetery, Belfast, Co. Antrim. If you enjoyed this post on "Westland Lysander P1731 crash at RAF Sydenham, Co. Down", please share with your friends and followers.